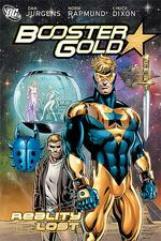 Exploding from the pages of 52 - and exploring the timeline of the DC Universe - comes this monthly book featuring the greatest Super Hero history will never know: Booster Gold! Longtime BATMAN writer Chuck Dixon pens a story teaming up Booster and Batman when a time-traveling villain from Batman's past attempts to destroy Gotham City! And in a story written and drawn by original Booster Gold creator Dan Jurgens, Booster discovers that the timestream has been inexplicably altered, unleashing all types of anomalies only he can put back in order! Guest-starring Batgirl and Elongated Man!